This recipe was born from a labor of love. Both in the same day, my DH told me he was out of shaving cream, and my Sis-In-Law asked for some help in dealing with my sweet nephew, (DC)’s cradle cap. I felt like that was as good a sign as any that I was supposed to ‘whip’ something up that would work for the both of them. Also, I don’t have a good moisturizer right now, so I was up for the challenge. I would need shea butter though, and that was an exciting prospect since it meant I got to support Alaffia; a great company, that is based here in my hometown. Not only do they sell finished products, but they also sell their handmade shea butter, (and in bulk if you’re local). It is more spendy than other brands; but worth it to me in knowing that the sourcing and the production of the products are both fair trade practices and that people are being treated kindly from start to finish. Being frugal is very important to our family, but so is “voting with our dollars,” and practicing careful consumerism. We strive to find a balance between the two. So I dreamed of an all-purpose mixture that would be healing, naturally emollient, and readily available for a variety of uses. After doing my homework, (because that’s what I’m good at), I came up with a cream that is fluffy, smells delicious, and will be the envy of all of my girlfriends, I’m sure. I presume, that as I beg my best friend for her cookies, she will most likely beg me for this! No, it’s not a cupcake. Although it looks delectable, you shouldn’t eat it! 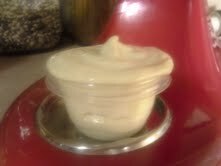 In a double boiler, melt coconut oil and shea butter. Remove from heat and stir in castor oil and infused olive oils. Cool for 5-10 minutes and then pour into a flexible container. A yogurt container worked well for me. Cool in the fridge until completely set up and hardened. (I did short stints in the freezer because I’m impatient). 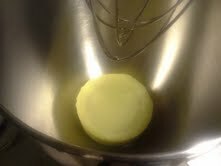 Wiggle hardened mass out of the container and into mixer. Whip on high for approximately 3-5 minutes. 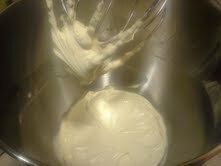 (I used a spatula periodically to scrape down the sides, so it was a lot of off and on of the mixer for me). Store in a lidded container in cool dark place, or perhaps in the fridge. That will be my preferred method of storage since our house has been kept quite warm this winter for Sweet Baby. Lets gloss over the fact that I don’t know the exact shelf life for this, since it is a new creation, but if you are concerned about shelf life, add a few capsules of vitamin E to extend it. With all of the antibacterial properties of the coconut oil, tea tree and lavender, storage shouldn’t be an issue, especially in the fridge. In my opinion, it applies like a lotion and rubs in like an oil. DH and I both shaved with it– I loved it and he hated it. He said it clogged his razor and he was scared to put oils on his face. Good thing he doesn’t do the OCM, then, right!? So, the experiment was definitely a DH shave lotion fail! But, an ultimate win for Mama! I cannot believe how soft my legs were after shaving with it! I would like to point out that if you are addicted to the foamy, gelatinous shaving cream, you most likely will not like to shave with this. But, if you are partial to the thin shave lotions, like the natural or organic ones made by Avalon or Alba, you will totally dig this! (LSB, this one’s for you)! I used it also as an all-over body lotion, and will use it on Sweet Baby too. No word yet on whether or not it helped Baby DC, but I’ll report back when I know… This would also be a great treatment for eczema or other winter-weary skin ailments. I also think this will be a great base for a homemade sunscreen! With a bit of zinc added and some beeswax, we’d bee in buzzness. Alas, that is another post for another day… Perhaps when the current temp is not 29 degrees Fahrenheit outside. Love it! Pinning for future use (when I have more time and energy). I especially like the idea of turning it into homemade sunscreen. I’ve never thought of that, but I HATE using the store bought stuff and here in Phoenix, it is a must. Thanks! Glad you liked it Colleen! It was super easy to make 🙂 Check back for the sunscreen post. I will work on it! Oooooh! I can’t wait to make this! Too bad my current shave cream will last for a year or so because I just got it a month ago 😛 But by the time I want to make this, perhaps it will also be time to make the sunscreen you hint at?? I hope you do another post when the sun comes back out because I would absolutely love to steer clear of the disgustingness of mass consumed sunscreen and try something sustainable. Thanks, as always, for an enlightening post! Thanks, Quorri! The sunscreen is on my to-do list for sure. I’m not putting that other garbage on my baby! This looks heavenly! Can’t wait to try it! You’re going to love it, Suzanna! This looks awesome! Thanks for sharing on The Creative HomeAcre Hop! Oo, I think I will try this! Thank you for linking up at Wildcrafting Wednesdays! Hi, thanks for the recipe! Can you please tell me what is the best way to measure the solids like Shea butter and coconut oil? Can you convert it to grams please? I almost always use a small digital kitchen scale to make my body care products. It makes life a lot easier, as most recipes you will find will be in ounces (or grams). My scale has a function to display in either unit. I picked it up for 10 dollars locally in my town. They are great to have around the house 🙂 I hope that helps. Hi again, thanks for your reply! I do have a kitchen scale however, you wrote the recipe in caps and T measurements and this is why I asked for the grams (ounces) quantities. Oh! Sorry! I had forgotten that I wrote that recipe that way. 🙂 I don’t have those conversions to grams for you, but there are many online calculators that convert different units really easily. I found one here. I hope that works for you! That’s alright! I wouldn’t like to use the link or recommend it to anyone as one cup of Shea butter for example, does not equal in grams to one cup of coconut oil… But that’s ok, I will figure the quantities out. Hello! Any update on the sunscreen post? (Or may I just missed it.) It’s getting hot here in Texas, and I’d love to whip something up for me and the babies! Thanks! Hi, I am relatively new to this adventure of homecrafting all my cleaning, laundering, and skin care needs. I tried this recipe and it is wonderful for my skin! It is a little on the oily side though and did not sink in a quickly as I would like. I am unsure of how to adjust this, perhaps just by slightly lowering the liquid oil content. I also added sugar and made a shower scrub. OMG! even after rinsing my skin is wonderfully moisturized, and my feet are like baby feet!!!!!! I have suffered with Psoriasis for 20 years and this is a first for me. 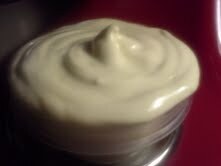 To feel soothed and moisturized all day is a blessing! Thank you. I am so glad, Kary, that it is working so well for you! I love hearing happy stories. Thanks for sharing 🙂 I have never adjusted this recipe at all, so I’m not sure how it would turn out, but give it a try. It does go on pretty oily, but soaks in eventually. It would be hard to use this all over your body and get dressed right away. On your next batch, adjust it and see what happens. Anything’s worth a try 🙂 If it turns out amazingly awesome, let me know!